Hey everyone! I'm excited to share my first "Meet the Sponsors" post. If you've checked out my Sponsors page you'll notice that anyone who purchases a Large Ad will be introduced in a blog post as well. 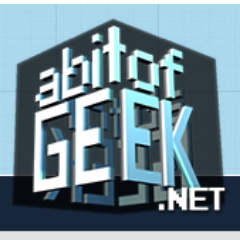 A Bit of Geek is an incredibly fun and informative site that I am sure all of you will enjoy learning more about! Miranda has provided us with some info and links about A Bit of Geek. I was able to meet Miranda at PAX Prime so I couldn't be more excited to welcome her and her colleagues as a sponsor. A Bit of Geek started as a hobby outlet back in May of 2010. I've always loved to write, journal, and document, but more than that I love to share with other people! I would ramble on over on my LiveJournal and Myspace, but after parking it on Facebook I lost the ability to blog. So, A Bit of Geek was born! Over the past (almost) four years now I have been working on growing my little corner of internet. I have moved from blogspot to independent hosting and encountered a lot of problems. I now have my feet mostly planted in WordPress and I expect more changes this year as I continue to mold A Bit of Geek to my ideal website! Early in 2013 I invited three other writers to join me to help expand the available content and add diversity to A Bit of Geek's voice. The four of us write in harmony about video games, board games, music, comics, crafting projects, TV shows, funny lists, and more. We updated every Monday, Wednesday, and Friday! Readers can expect game reviews, personal opinions on industry trends, informative write-ups, lots of pictures, top ten lists, art videos, the occasional tutorial, our experiences at geeky events, and a whole lot of talking about the things that we love. We encourage and enjoy feedback on our articles as well as on our Facebook page! Getting a discussion going is one of our main goals and is certainly one of my favorite things. The future of A Bit of Geek includes more crafting projects and tutorials, more frequent video content (art, funny, and miscellaneous), a product or two for sale, and more giveaways for our wonderful readers! A Bit of Geek can be found all over the web. We have a presence on YouTube, Tumblr, Twitter, Facebook, and even a Pinterest and Google+ page! We are most active on Facebook, Twitter, and Tumblr and are happy to answer questions. To get a taste of the A Bit of Geek experience, here are a few articles that I think really show us off! Just one in a delightful series from Tom where he gives a fun and detailed rundown of a video game character. A photo journey of my nephew's 6th birthday party. A hilarious list of very serious questions from Rachel. A complete retelling of my magical night. Zach gives a talk about the key role that music plays in our games. A challenging and hair pulling list that Tom forced us to write, but now you all know us a little bit better! And if that's not enough, here are the two most recent videos that we've posted! I noticed were both Nerd Burger sponsors, lovely blog! !